The UO is reaching out to students across campus as it prepares for mass vaccination clinics beginning March 2, part of an effort to stem an outbreak of meningococcemia illness. The clinic will be held at Matthew Knight Arena and will run through March 5. 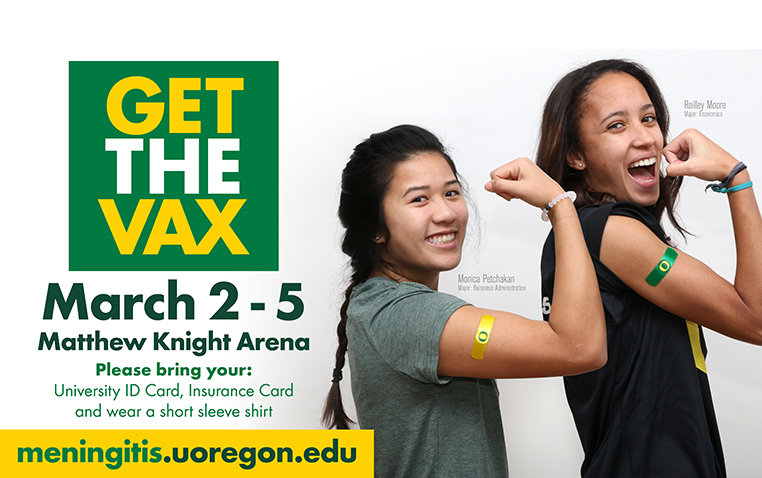 In addition, students can bring their UO identification card and insurance card, if applicable, to the Matthew Knight Arena or one of 15 Albertsons or Safeway pharmacies or one of seven Walgreens to get the meningococcal B vaccine. A list of participating pharmacies is available here. University officials stress that the vaccine available at all the clinics — including at Albertsons, Safeway and Walgreens stores, is available to all undergraduates and all students age 10 to 25, as approved by the Food and Drug Administration. The vaccine also will be administered to anyone, regardless of age, in a high-risk group that includes those with compromised spleen function, with complement immune system deficiency or who live on campus. Faculty and staff who are not included in the high-risk group are advised to contact their physicians to discuss vaccination. Four UO students have contracted meningococcemia, the blood-borne form of meningococcal illness, since the beginning of the year. One of them, Lauren Jones, died from the illness last week. The university and public health officials are working to obtain the thousands of doses of the vaccine needed to inoculate the entire student body. Mass vaccination of the entire student body is seen as the best way to protect the campus community. Vaccination is strongly recommended for all students to protect themselves and others. The vaccinations being offered will be the first of three required doses. Health workers distributed more than 2,000 fliers at the men’s basketball game Sunday at Matthew Knight Arena and to fraternities and sororities. Also, a message has been posted on DuckWeb that all students will see when they log in to register for spring term classes, an email is being sent to all students and information is being sent through social media and posters around campus. Meningitis can be fatal and can progress quickly. The meningococcal B vaccine helps protect against the meningococcemia form of the disease responsible for the four UO cases. Meningococcal disease is an infection caused by a specific type of bacteria, Neisseria meningitidis. When these bacteria poison the bloodstream, they cause meningococcemia. However, these bacteria can also invade the brain and spinal cord. When this happens, it is called meningitis. Adolescents and young adults are at increased risk for this disease, but the majority of cases are vaccine-preventable. Until recently, vaccines only protected against four major strains, or serogroups, of the bacteria: A, C, W and Y. All three UO students who had meningococcemia and recovered had the serogroup B form of the bacteria. The recently approved vaccine for serogroup B is being made available to students in the current outbreak. The university is working to keep the vaccine as affordable as possible for students and families. Students who are insured by Aetna, the Oregon Health Plan/Medicaid and the GTFF-provided plan are covered for Meningitis B vaccines. This week, UO leaders are working with insurers to facilitate direct billing and expects that to be set by the start of the large-scale clinic beginning March 2. Uninsured or underinsured students can receive assistance with signing up for state-supported plans at the large-scale clinic beginning March 2. For additional information about the available vaccine or meningococcemia, visit the health center website meningitis.uoregon.edu.